Walli — a new series of FIBARO switches and outlets — is the first complete series on the market with smart and classic outlets and switches. The new solutions support the voice assistants control, are much easier to install, offer much more advanced settings and their unique design makes them indulge any interior aesthetics. Apart from flush-mounted smart outlets and switches, brand new series will include Walli Controller to assign any smart feature at any place around the house! Walli switches and outlets are a complete series that allow to maintain visual consistency throughout the entire house. Both smart and classic sockets and switches have a common high quality design to perform unprecedented user experience. Each of the devices of this series is characterized by a unique texture of materials, enclosed in an eye-pleasing form with an LED ring that can be customized. The smart part of the Walli series gives you more advanced settings and connections with other devices. A good example is when the system itself detects reduced power consumption in one of the outlets, i.e. when the TV is turned off, it will switch off the power in the other outlets in the room to save energy where it is no longer needed. Thanks to the complexity of the new series of switches and outlets, the energy consumption measurements and analyses are now much more precise. With hard data of this kind info the user can optimize house spendings. Voice assistants are core features if we speak of Internet of Things. Walli outlets and switches series are ready to work with voice assistants such as Amazon Alexa, Siri and Google Home via FIBARO system. 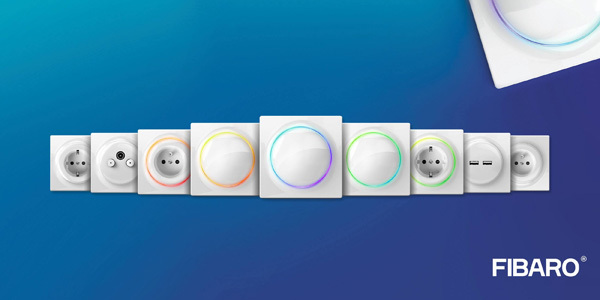 Both sockets and switches operate together with the FIBARO control panel based on wireless Z-Wave communication, giving the most efficient and user-friendly ecosystem available on the market. The new FIBARO Walli smart outlets and switches can be installed at any time and can be included in an already existing circuit. Replacement of non-intelligent devices with FIBARO smart alternative may be divided into stages. Replace the old technology systematically with new outlets and sockets designed by FIBARO. Advanced and compact technology makes the product ready to be connected directly to any electrical circuits and placed in the flush-mounted boxes. Installation is 4 times faster compared to installation of the flush-mounted modules. Save time and money – it is the easiest way to make a smart environment. The flexibility of the series will be reflected in the Walli Controller which has similar features to The Button. Its shape does not differentiate from the flush-mounted switch so that it can be placed exactly where the user always lacked a switch for light, roller shutters or heating. The outlets and switches series will hit the market in mid-2019. Z-Wave technology used in Walli outlets and sockets enable successfully management of other devices in a home. Comprehensive piece of tech of this kind bumps up comfortand ease of control of individual devices. Moreover, the switches and outlets are equipped with parental control feature – disable manual control of the switch or outlet and manage restrictions only to the level of the mobile application. That’s not all because each electrical outlet is equipped with protection to prevent electric shock. FIBARO is an Internet of Things global brand providing solutions in the field of smart home and building automation. In just a few years, FIBARO has settled on six continents in more than one hundred countries becoming one of the most advanced wireless smart home systems in the world. The system is entirely created, developed and produced in Poland – both the headquarters and the FIBARO plant are located in Poznań. The company employs almost 400 employees. Since July 2018 the brand is a part of the Nice group. The mission is to indulge people lives all over the world by creating a comfortable, friendly and safe home environment.